If you are applying for a Mortgage Adviser job in London, Manchester, Liverpool, Birmingham or anywhere in the UK you may need to write a covering letter to support your application. Here is your Mortgage advisor job application letter example! Please accept this letter as my application for the recently advertised vacancy for a Mortgage Advisor in the South East. I believe that I have met all the criteria listed in the job description throughout my 4 years’ experience as a Mortgage Advisor working within a small team where I complete the full range of tasks from greeting the customer through the door, assessing personal circumstances and discussing preferences through to making referrals and completing application forms. I have continued to meet and exceed personal sales targets and referrals over the past 18 months. The priority for me is always providing the best customer service to every client whilst ensuring that draw-downs and related products are maximised to generate profit for the firm. The challenges and variety involved in working for a larger company is particularly attractive to me where I consider my extensive communication skills, knowledge and passion to get it right will be an asset to your company. I enclose for your consideration a copy of my CV. Should you require any further information or have any questions please don’t hesitate to contact me on the above contact number at any time. I thank you for your time and look forward to hearing from you at your convenience. 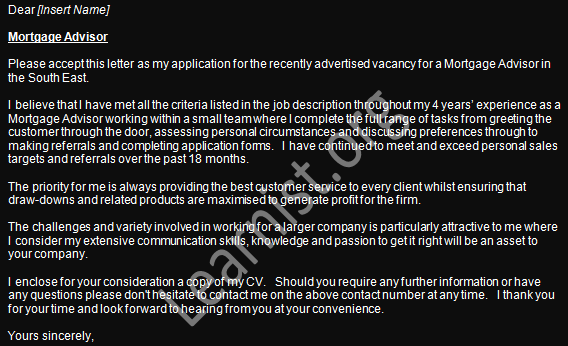 View more job application and covering letter samples!